For their 2015 air show, Randolph AFB had a pretty impressive line-up of static display aircraft scheduled to participate. It was this alone that compelled me to make the drive to San Antonio in hopes of catching some arrivals the day before the air show itself, which was held October 31 and November 1. Knowing the winds were out of the south we drove to the north side and parked in an area that I previously scouted on Google maps, just east of RWY 14R. Once we arrived at the spotting location here came the light to moderate rain which was on and off again for about an hour or so. Thankfully a short time later the rain stopped, but the skies did remain rather dark and I knew it was going to be a challenge for me to photograph whatever may come in. Especially military grey aircraft against low lit dark skies. Shortly after meeting up with Justin and Andy, here came our first arrival. 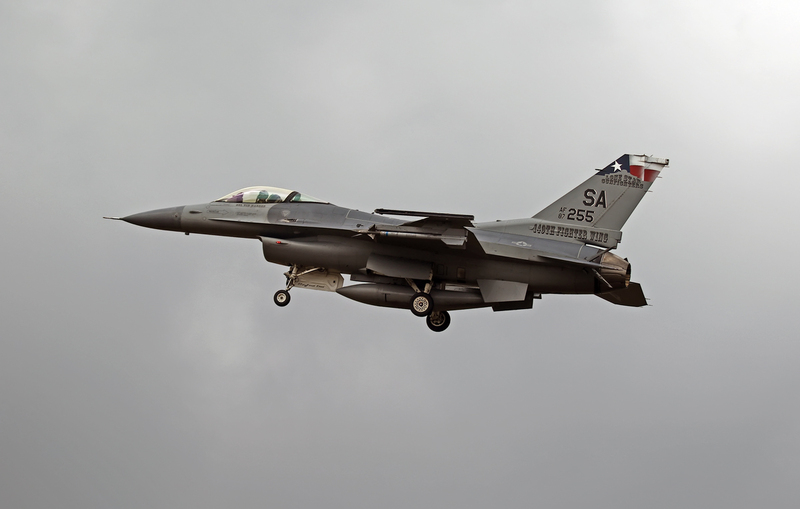 It was an F-16C (block 30) which happened to be the “Wing King’s” jet that belongs to the 149FW, 182FS (Lonestar Gunfighters) out of Kelly Field Annex in San Antonio. This was followed by an F-22A (radio callsign George) from Tyndall AFB (325FW) also marked as a “boss bird”, 325 OG (Operations Group Commander), and lastly a pair of A-10Cs (radio callsign Chisel) from the 442FW, 303FS assigned to Whitman AFB, MO. Once these touched down the arrivals came to a stand-still. It was now time to move to another location to catch the Thunderbirds practice. 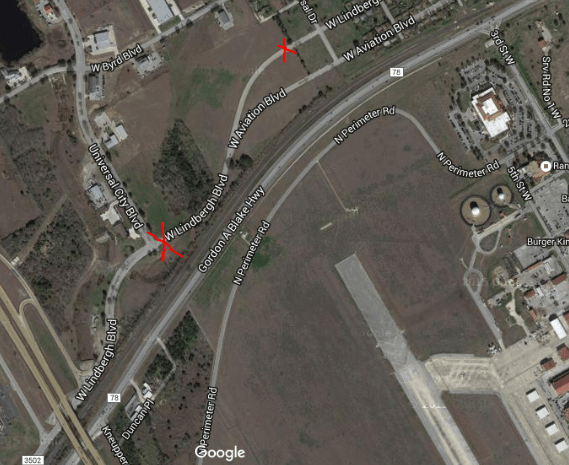 The location we chose for this was along Loop 1604 at a Dollar General store located on the west side of the airfield with close proximity to the perimeter fence. We chose this spot because it was very close to show center. It was our hopes that the solo who performs the “minimum radius turn” would do so in close proximity. As it turned out we could not have chosen a better place to see it. We were literally in the center of his turn. It was so awesome to watch it from that vantage point as he stood that Viper on its left wing making that high speed 360 degree turn in afterburner. Wow…..what a sight and sound that was! As you can see in one of the pics, the dark skies and humidity made for some dramatic vapor that just poured over wings and back beyond the tail and horizontal stabs. Even the wing-tip launch rails has some vapes coming off them. After the Thunderbird practice we made our way back to the north side to see if we could catch any more arrivals. Unfortunately it turned out to be a bust military wise. Shortly before my leaving at 7:00pm a P-51D and a TORA-TORA-TORA dive bomber came in that I didn’t take any pics of having seen them so many times in the past. I didn’t attend the show, but as predicted the statics were pretty impressive. Besides the F-16C, F-22A and A-10C,s that I took pics of, other statics included a KC-10, KC-135, QF-4E (53 WEG tail markings), F-16C (block 32) from the 64AGRS at Nellis, C-5A from Kelly Field and a pair of F-35As from Eglin AFB. Most came in on Thursday I was later told. Armed with that info I’ll be sure next time to spend both Thursday and Friday spotting arrivals. Next → Next post: Airwingspotter in E spotters!